We had a wonderful Easter Sunday, despite being thousands of miles away from our families. 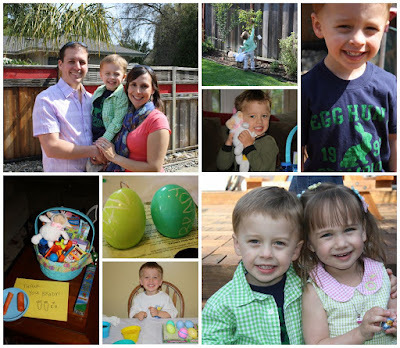 We started off the day with a small Easter egg hunt in the family room, after Brady ransacked his Easter basket (for a run down of everything that was inside, watch this ridiculous video I made!) and devoured several bunny marshmallows, 2 mini Kit Kat bars and a Reese's peanut butter cup. We hope you all had a wonderful holiday and we look forward to celebrating with our "family" here again next year!